During the Christmas holidays, I’ve seen a lot of deals for those new fancy wake-up lights from Philips. 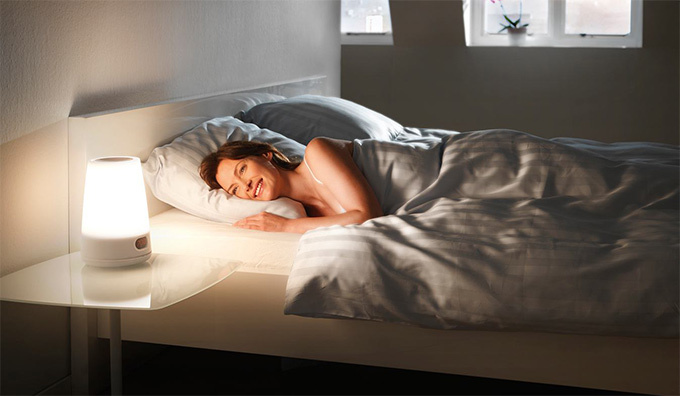 It promises a smooth awakening each morning with a simulated sunrise. I’d imagine it to be pretty awesome to have considering my painful Windows Phone alarm, which blasts bad music at me each morning at full volume. But the wake-up light as just a new alarm clock (and perhaps a desk lamp), it’s very expensive at around 80€. So I thought, why not make a sunrise simulating wake-up light yourself! It won’t necessarily be much cheaper but it’s going to be infinitely more fun. If successful, the result should look something like this. I hope to wake up with a huge smile every morning as well. I’m still waiting for my Raspberry Pi, though. But considering its shipping times, it’s just a matter of months (hopefully just weeks), until I can hold it in my hands and start stitching together the system. Meanwhile, I’m going to read through some electronics literature to get my electric engineering knowledge up to par. I will keep you informed about the progress of this project. Hi, I googled this topic and came accross your blog since I had the same idea of linking google calendar (or other calendar) appointments to the wake-up light. How’s your project coming along? Hi Wilfried! The project hasn’t gotten very far yet unfortunately. The last 2 months I just spent studying for my exams and there wasn’t much time to do other stuff. I had my last exam a few days ago, so now I can actually go ahead with building the lamp, finally. First or second thing tomorrow I’ll do is buying a quality AC adapter to power my RaspberryPi, which I finally have as well! Then I’ll have to setup the Pi and check how I actually hook up the circuits with it. I also haven’t decided on a lighting solution — either dimmable LED bulbs or (coloured) LED strips / diodes. It should be affordable, bright and preferably safe! I haven’t thought much about the software end yet as I’m still unfamiliar with programming for the Pi, what languages or APIs to use. I’ll be posting updates as the project progresses! I am really curious about this project. Google brought me here, as I had the same idea of buidling a Wake Up Light with a Raspberry Pi. But.. because I don’t have any experience with programming and Raspberry (nor the time to familiarise), I am reliant on s.o. making a noob-proof tutorial :). As the project of AmbiPi (Ambilight & Raspberry XBMC) shows, this small computer is really brilliant. I’ve spent the last week with reading through A LOT of electronics theory about transistors, LEDs and circuit design and finally got a plan of how to build this lamp :) I plan to write a comprehensive guide about it! Right now, I’m just waiting for all the components to arrive I ordered 2 days ago, which will hopefully not take any longer than 1 to 2 weeks from Singapore and China. I’m really excited! I’ve also seen the AmbiPi project, simply amazing effects. I’m really intrigued by do-it-yourself interactive lighting solutions. nothing new on this project? Actually, there is a lot of new on this project. But I’m prone to keeping my thought process to myself and am not really as good at blogging as I’d like to be. I’m trying to improve on it and make my development process more transparent. I’ve been constantly building up on tools, materials and know-how. As I’m very unfamiliar with most technologies involved, I’ve been reading up on all possibilities to create an execution plan that is solid. I’ll write up some articles very soon!